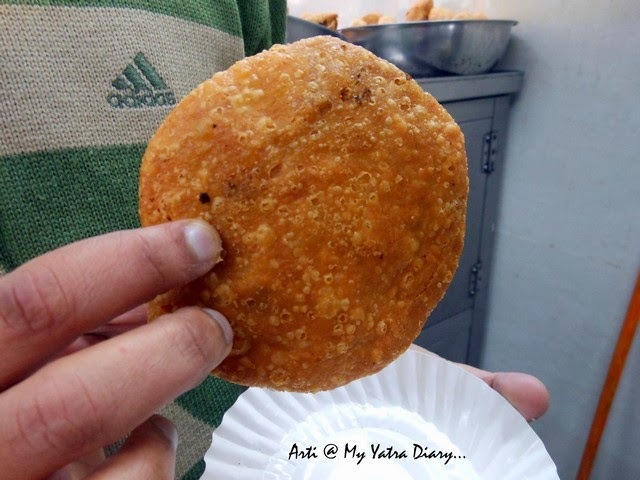 Pyaaz Kachori, Dal-Bati, Jalebi and More: What to Eat in Jaipur and Where! She is bedecked in ornate havelis, opulent palaces and arched havelis. One glance at her magnetic beauty and be warned: You will be smitten. Love-struck for life. Not that there’s much about it that you can do though. Jaipur is like that, impossible to not fall for: graceful, charming, elegant … and royal – only some of the adjectives that follow her like a troll, in guidebooks, in destination leaflets and also on My Yatra Diary. It’s true too – for all the wonderful sights that she packs in, Jaipur oozes every bit of royalty in every sense of the word. But, can you guess what makes the city truly royal for me? Let me tell you. It’s her crazily delicious food – therein lies the charm in her persona that actually connects her to the common masses on the streets, the Aam Aadmi, despite all the royalty talks. There are so many tantalizing flavors to choose from – Samosas, Kachoris, Jalebis, Lassi, Kanji vadas, Gatte ka saag, Missi roti, etc. – you might as well imagine the whole of the city as one BIG buffet restaurant where you are free to stop, choose, pick, fill your plate and then move on! So, let’s not waste any more time and set out for a finger licking, lip smacking roller coaster gastronomic ride on the streets. Dig in! BREAKFAST @ SAMRAT FAST FOOD CENTER: PYAAZ KACHORI, SAMOSA, JALEBIS, SPECIAL TEA. Don’t be fooled by its modest appearance. of the old city and it’s been standing there for a series of decades now. Rather, take delight in the crunchy crispy delicacies that it has on offer. They have a decent standing eating area outside along with a takeaway counter and a somewhat cramped seating space inside, both of which cater to hundreds of empty stomachs every morning. The place is fairly clean, prices are unbelievably reasonable and the taste of the dishes extremely appetizing – some of the reasons why it’s so popular with the locals. At Samrat, there is a lot of fried stuff on offer but it’s their Samosas, Pyaz Kachoris and Jalebis that I love best. What adds to this delightful flavor is the fact that you can actually see the Samosas - boiled, mashed, spiced potato filings in deep fried conical flour case - and Pyaaz Kachoris – again deep fried and punched with a strong Pyaaz or onion essence - coming nice and crisp out of the boiling oil right in front of your eyes. Hot piping Kachoris taking a dip in the bubbling oil. 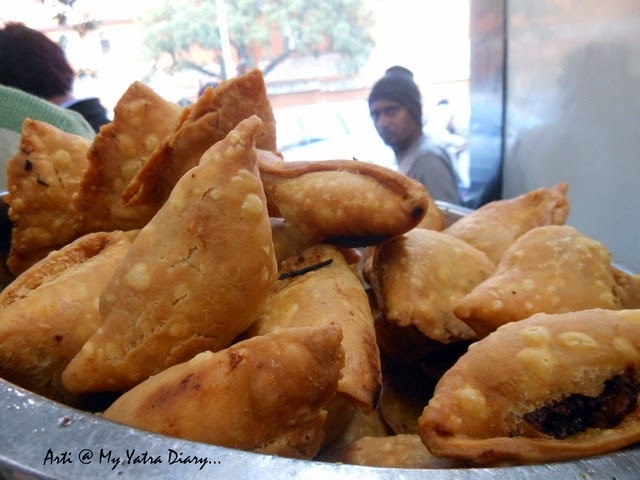 You just can't miss the strong essence of onion in Pyaaz Kachoris. 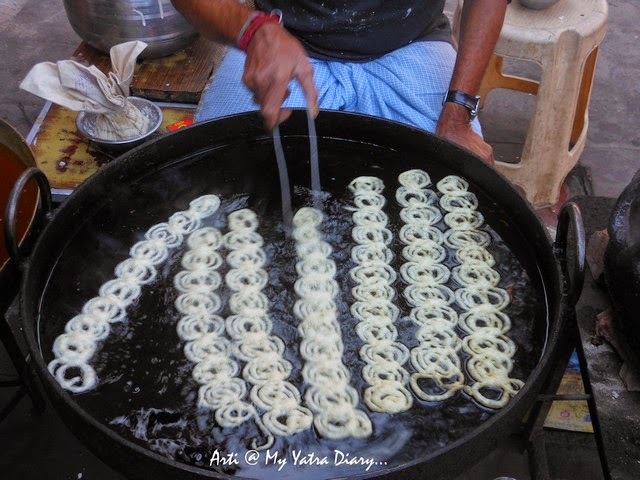 Of course, this breakfast is not complete unless you help yourself with a generous serving of hot piping Jalebis coated in the sticky-slurpy chasni. 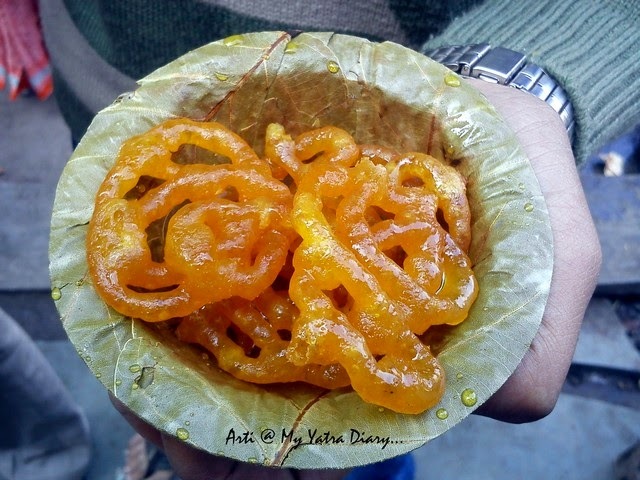 These incredibly sweet Jalebis are pretty thin, so you can eat 5-6 pieces at one go and still walk away feeling light on the stomach. After gorging on the richly fried stuff, I always wash it down with a cup of Samrat’s special tea which is really good and a great way to wrap up your first morning meal. Samrat Fast Food and Caterers is located on the Chaura Rasta, shop number 272, opposite State Bank of Bikaner. Head east from MI Road and turn left at New Gate Circle onto Chaura Raasta. The shop is canopied by a huge tree and shall appear on the right. LUNCH @ HANUMAN DHABA: SUBZI, TAWA PHULKAS, PAPAD AND ACHAAR. Hanuman dhaba looks like any typical Indian dhaba that you can imagine from the Indian highways, except that this one is located in one of the most prime locations of Jaipur. The ambiance stays true to the name – basic seating arrangement with pictures of God Hanuman adorning the walls. Popular with the locals for serving hot and fresh food, the dhaba has two floors for catering to its wide chain of customers which includes people of all ages and groups – from students to professionals to families and travelers. 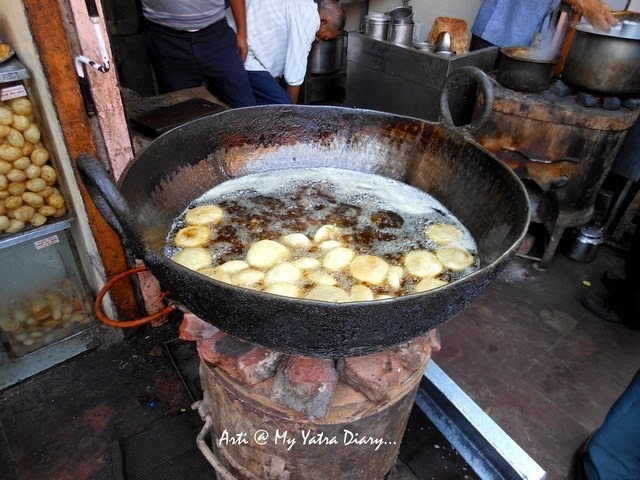 When I went there last, I ordered sarson ka saag and makki ki roti which was the ‘dish of the day’ along with chana masala and missi roti which tasted quite simply homelike – just what I was looking for. The prices are worth the quality of the meal which left me feeling nice and full. 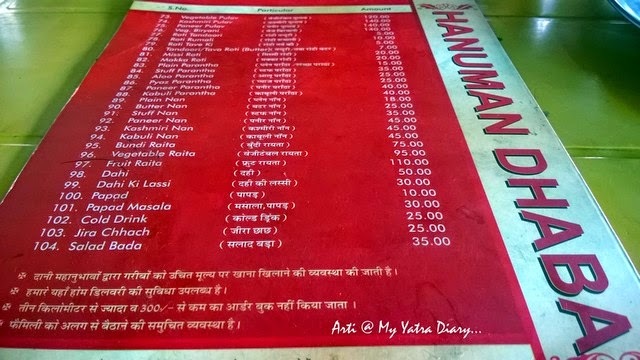 Hanuman Dhaba is located in the posh Raja Park area in Jaipur at shop numbers 72-77. You can first conveniently reach Raja Park area and from there, take the Vidyalaya Marg. Keep your eye towards the right, Hanuman Dhaba will be there! LASSI @ OLD FAMOUS LASSIWALA, MI ROAD. 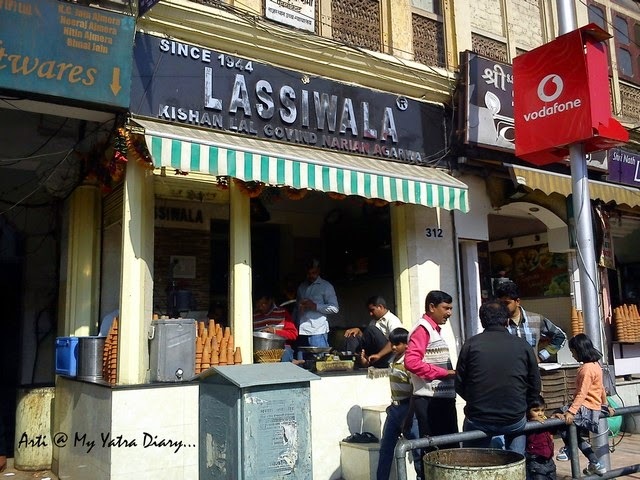 As far as I am concerned, after the lunch, all I need is a cool glass of Lassi at MI Road. The shop remains busy for most of the mornings through the afternoon serving heavenly milk based preparation of lassi in small earthen glasses known as kulhads. The place maintains a good standard of cleanliness and hygiene as it popularly caters to not only to the locals and the domestic tourists but the international crowd as well. What else but Lassi! Sweet sour whipped yoghurt topped with a thick rich creamy layer sometimes scented with a rose flavor, the glass of lassi comes in two sizes – big and small. 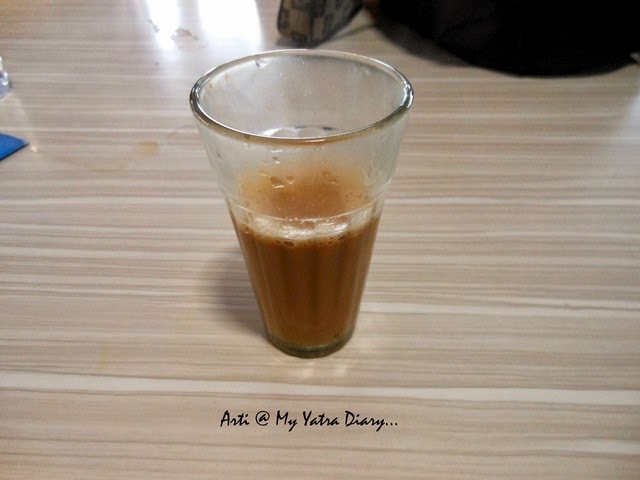 Though the curdly coolant can be a bit heavy on the palette but the taste is so refreshing and cool that I easily gulp one glass full even when I am there after my meals! Beware of duplicate shops though; there are many that have now sprung up in the vicinity. Make sure to head to the one in the far corner Kishan Lal Govind Narain Agarwal, the name of the original proprietor under which the shop has been in the running since 1944. Reach the MI road and ask the locals for the oldest famous lassiwala, I imagine it would be impossible to find a local who would not know about this place – it’s legendary! Timings: Till 12.30 in the mornings only. SNACKS @ BAPU BAZAAR: PANI PURI, SANDWICH, ICE CREAM. 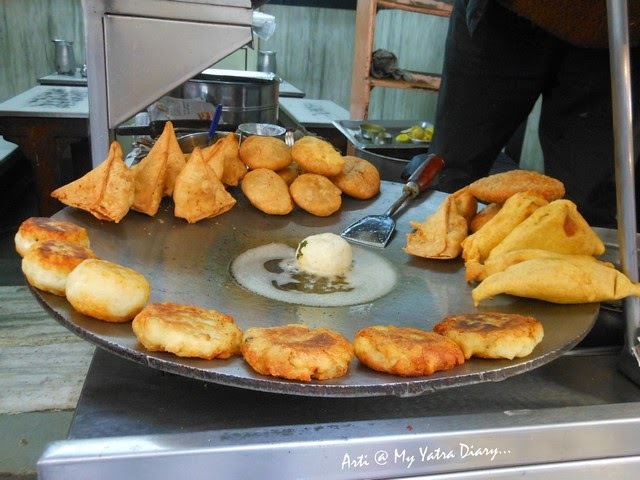 Step in, in any respectable street corner and you will find a thela or hole-in-the-wall shops dishing the savoury spicy insanely tasty North Indian snacks wafting out a tantalizing aroma that are irresistible to miss. These are shops that don’t necessarily have a name and often come across as dubious in their hygiene standards. The best way to figure them out is to select the ones that have a crowd around their cart – if they are famous with the locals, it’s for a reason! 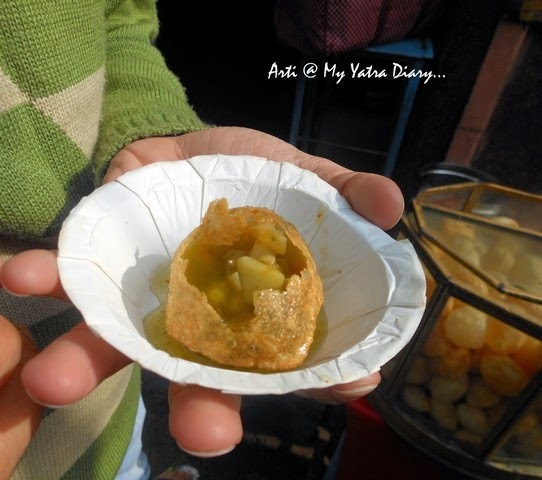 To satisfy my Pani Puri – crispy flour dumplings dunked in tangy water infused with the right amount of spices – (and for shopping, of course) Bapu Bazaar is the place I head to. At the junction of Saraogi mansion, just where Bapu Bazaar starts, there are a few thelas specializing in savory Indian snacks. These push carts are not famous by any name but you can easily spot them by the flocking locals during the afternoon and evening times. for Rs. 20, this guy makes excellent sandwiches too. 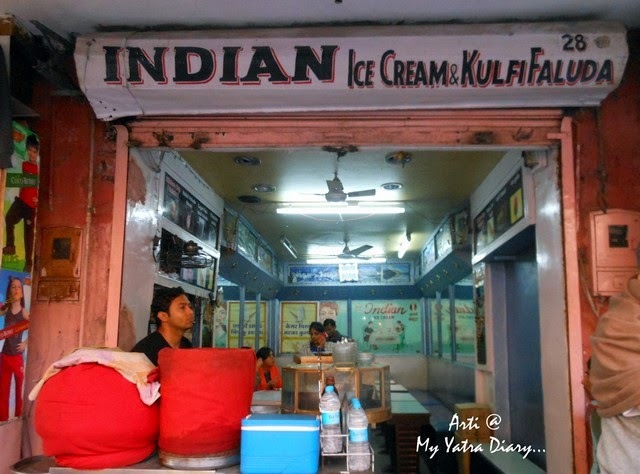 Walk further from the Saraogi-Bapu junction, about 10 shops later, you will find this Indian Ice cream and Kulfi Falooda joint on the left hand side. The goodness of their ice creams can be gauged by the fact that it is a hit with the customers not only in the sweltering heat of the city but even in the winter season! The mixed Kulfi Falooda cup is a rich creamy gooey delight with all sorts of colors - pink, yellow, white popping out onto you. 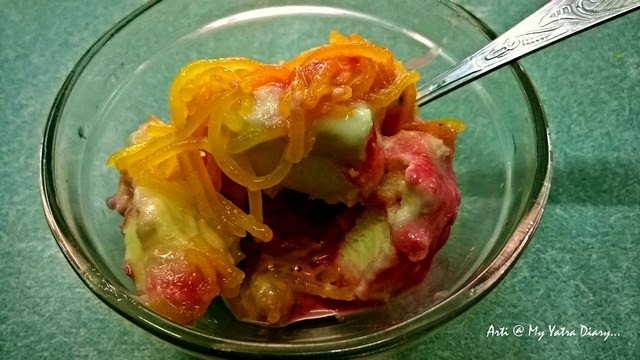 Topped with slimy falooda noodles, it's worth going for at least once during your trip. Rich and creamy Indian Kulfi - to beat the heat! Ask anyone for Saraogi mansion or Bapu Bazaar, both are landmarks in their own right. 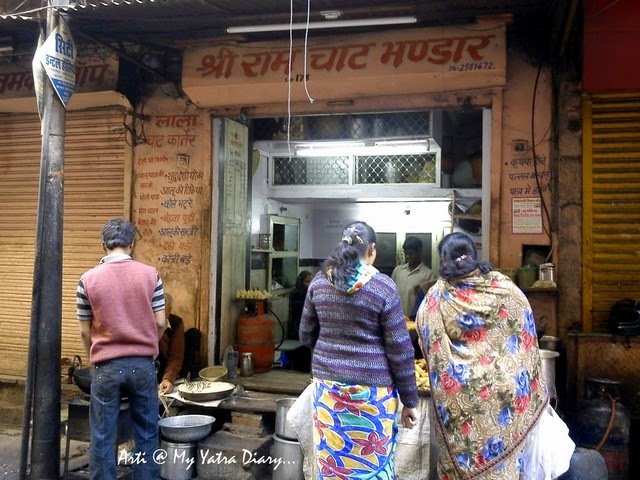 This no-name hole-in-the-wall little foodie corner is spread right at the junction where Saraogi Mansion stands and the colorful shops of Bapu Bazaar starts. 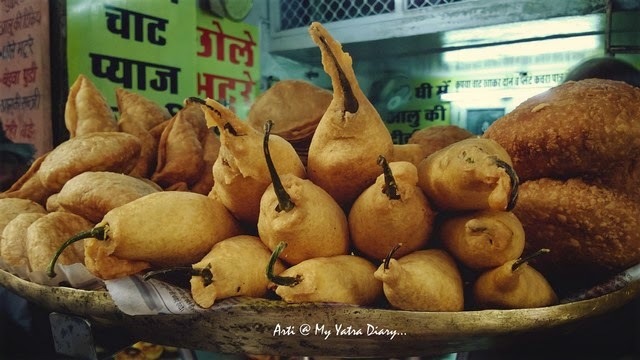 SNACKS @ SHRI RAM CHAAT BHANDAR: MIRCHI VADAS, KANJI VADAS. If it’s a truly Rajasthani snack that’s on your mind – try the Kanji Vadas at Shri Ram Chaat Bhandar located at Gheewalon ka Raasta. 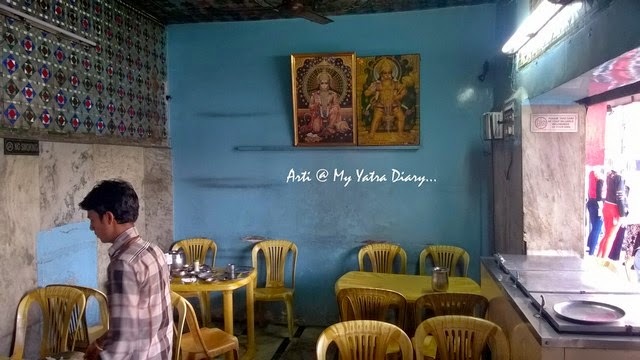 It’s a small hole in the wall shop lined along the chaotic narrow alley of Ghee walon ka rasta and boasts of its own set of loyal customers passed down through generations. There is a small sit-down eating area inside or if you are in a hurry – you can stand and eat outside too but beware of the never ending traffic. The place is decently clean with the owner, a humble courteous Marwari, serving with a warm hospitality. My pick of the lot is the extremely fluffy and incredibly light Kanji Vadas which are moong dal dumplings soaked in a spicy, flavorful, mustard liquid that is exceptionally good for the stomach as it is for the senses. 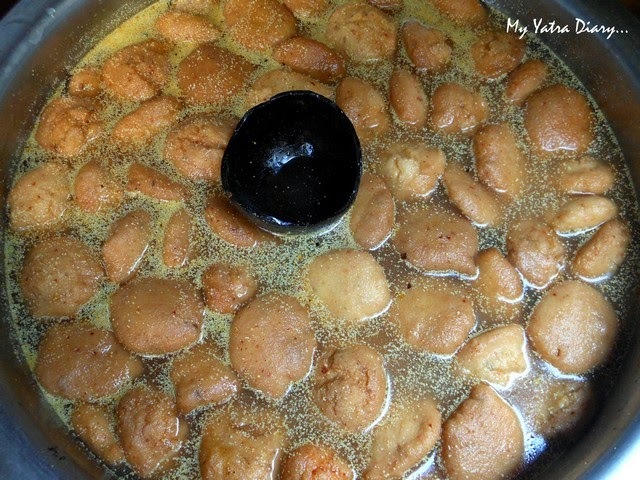 The soft and fluffy Kanji Vadas dunked in delicious mustard water. Priced at a modest Rs. 20 per plate, the Kanji Vadas are light and healthy not only on the stomach but on the pocket too. Don’t forget to ask for an extra serving of the tantalizing refreshing liquid Kanji – it’s an amazing digestive concoction that will empty your stomach for more! 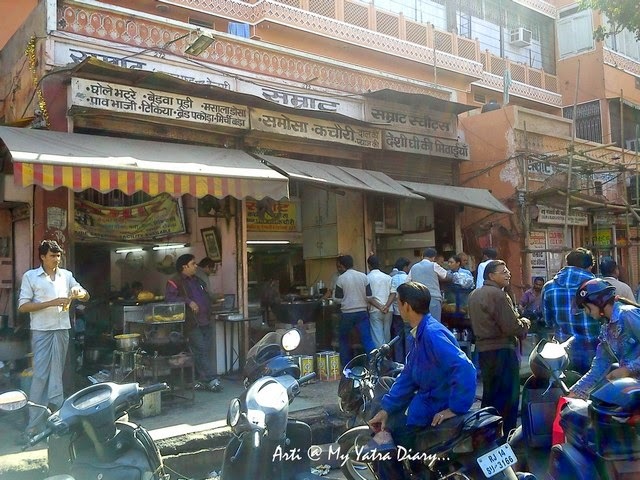 Shri Ram Chaat Bhandar is located at shop number 176 in Johri Bazaar near Jain Mandir. Pass the Sanganeri gate and continue straight to reach the Johri Bazaar and Gheewalon Ka Rasta. The shop will be on the right. 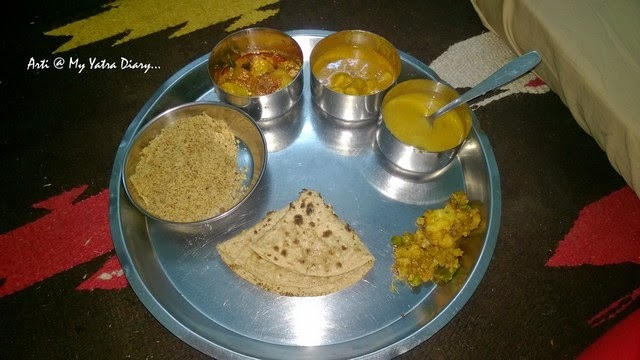 DINNER @ HOME: AN AUTGHENTIC RAJASTHANI MEAL. All said and done – like we bloggers always do, I too saved the best for the last. 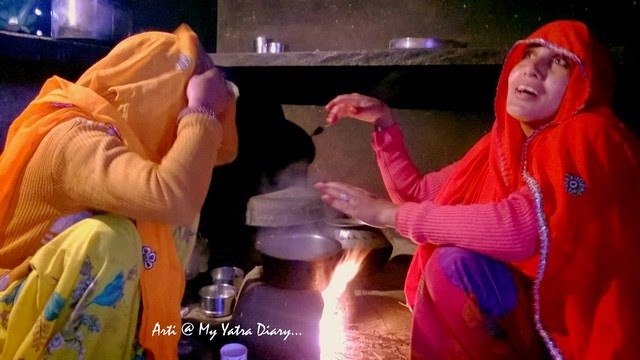 Getting invited to a Rajasthani home for a warm, cozy dinner in the company of a loving family is something that nourishes not only your tummy but also your soul. Bajra Bati and Churma being prepared for the home meal. I consider myself really fortunate to have had a chance to savor such delicious meals serendipitously at places and with people I never thought I ever would. Food being cooked and smiles being swapped - bliss! These homes might seem very basic - somewhere off the track, on dirty mud tracks, lighted with oil lanterns – but they are infused with such a heavy dose of love and warmth that you simply won’t find elsewhere. The same energy is further passed on in the meals they cook – which is doused in traditional Rajasthani flavors using a lot of gram flour, pulses, dried vegetables and pure ghee in their preparations. Yummilicious food along with tales swapped together make for a memorable evening worth relishing for a lifetime. I know there's a lot that I have missed out here! that I should try the next time I am in Jaipur? or buffet dinner in Jaipur - it could be anything - write away! Makes me hungry Arti! Hope you have a lovely weekend! Awesome post :) Thanks a lot for your post. Great food picks! Jaipur seems to be a city for foodies. I am heading there this monsoon..will remember your suggestions. Thanks! 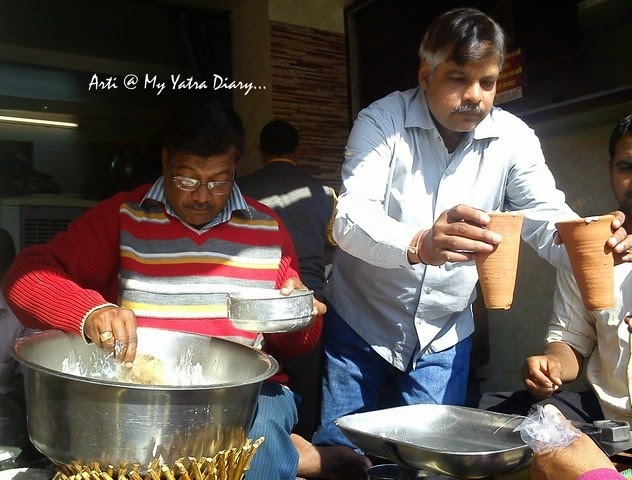 Whenever i go back to my home town Ambala, i go for a few of them...there are a few shops with their own specialties. Such yummy looking food and it is making me hungry just looking at it. My mouth is watering. I will keep these places in mind as I am visiting Jaipur shortly. Thank you for that lovely ride, Arti. So good, so many calories! yum yum yum yum .........yummylicious post dear !! Yummy post! 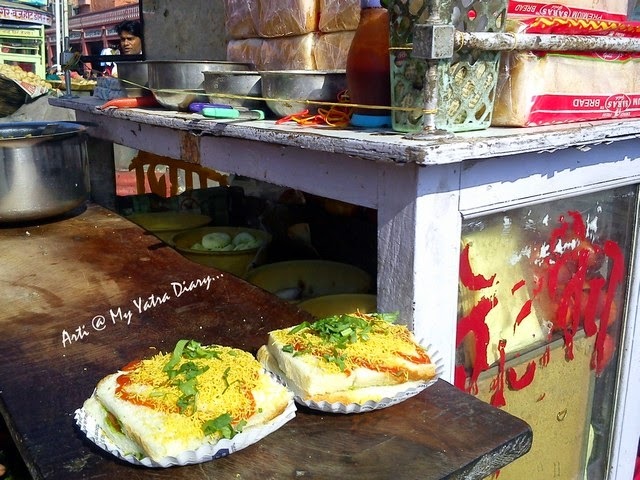 Jaipur is a foodie paradise! This is quite a detailed post. And I like that you have told us about the nooks and crannies rather than big hotels. Some of these like the lassi or bombay sandwich is something I wouldn't have attributed to Jaipur. The Kanji Vada sounds interesting. 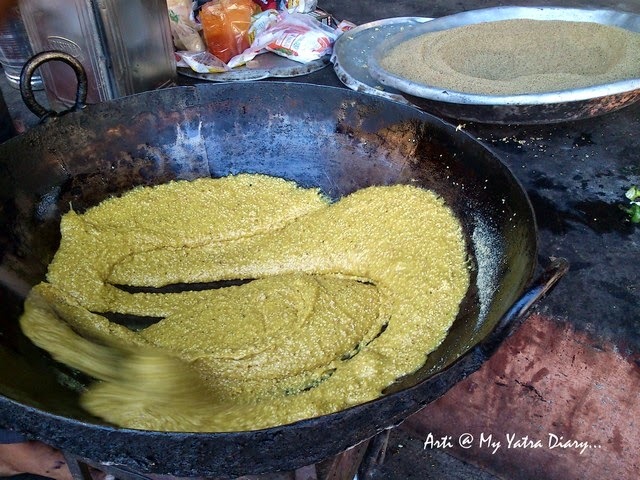 And of course, Dal bati is a mainstay of Rajasthani cuisine. Have you seen the movie desi Romance which is set in Jaipur? What struck me about it was the yummy food Rishi Kapoor is always eating. I think you have given us a taste of that. Palate tickling...enjoyed the chat land immensely! Everything looks so yummy & delicious, Arti! I remembered the street food of Odisha. Love all the Incredible India food! So much variety & so good! I started salivating looking at those images. Awesome. Well,well,you have wrapped them all up in this delicious post.I don't think anything remains to be said.Rajasthanis are real foodies and everything you mentioned tastes out of this world but the only problem is the chilies lots and lots ! 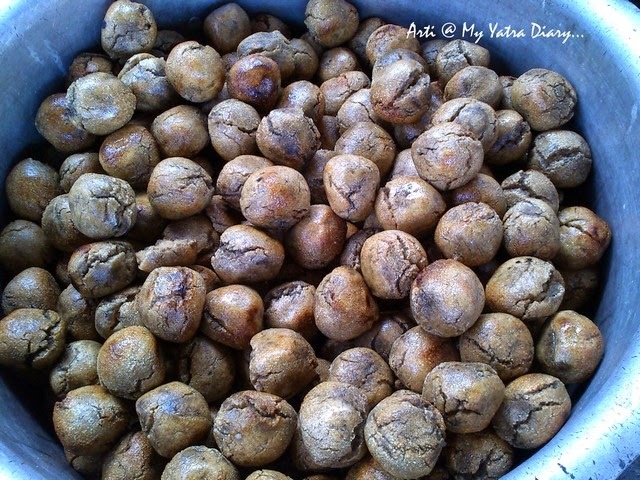 Such a yummilicious post with such mouth-watering pictures and descriptions. These all look so delicious, Arti! My mouth started watering at those Samosas. Yum! Thank you for a wonderful tour of the food and spices of Jaipur. What a great experience it must be to eat with the local family. Thanks for this tour! hey, that sounds so yummy....the glance at pictures is enough.I love the chat junks of india. I’d like to thank you for the efforts you have put in writing this blog. I really hope to check out the same high-grade content by you in the future as well. In truth, your creative writing ability has encouraged me to get my own personal blog now and it is a perfect site for anyone who wants to understand this topic. You have put a tremendous effort in writing a fresh spin on a topic that has been written about for a long time. In short, great stuff, just wonderful. Why not writing for us at http://www.ultimatediscovery.in and do the honors. Wow, definitely these are the famous Indian food eaten by every Indian people. These foods are very tasty, I always try these foods whenever I away from my home. 5 Hotels where you can stay in Jaipur.